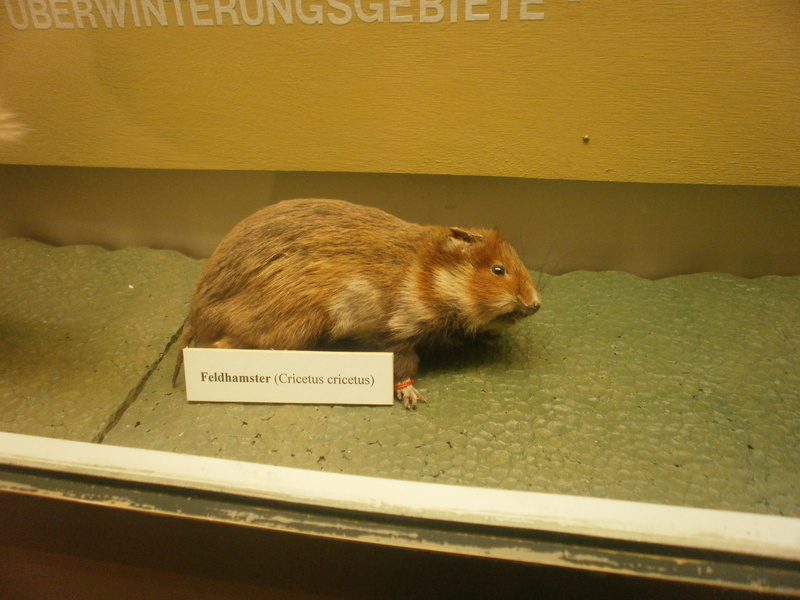 I took this photo of a common hamster or European hamster (Feldhamster in German) at the German Hunting and Fishing Museum in Munich (Deutsches Jagd- und Fischereimuseum). Other names for this animal are the great hamster or the black-bellied hamster. I prefer to call it the common hamster. It is from this species that we get the word hamster, which is derived from the German word hamstern, which means to horde. The species was once relatively common in farm fields in Western Europe, but now it is quite rare. It was once trapped as a pest species and for its fur. It is significantly larger than the typical domestic Syrian hamster, but this specimen wasn’t particularly large. It was maybe 20 percent larger than a female golden hamster. I have plenty of photos from this museum, which I will be uploading in the near future.